Bulk pill tube key holders made of aluminum and custom imprinted with your logo or message. We also supply wholesale blank (not imprinted) pill tube key holders for $0.89 each. 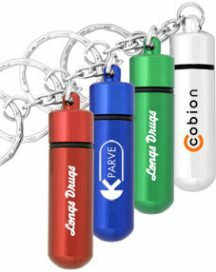 Lowest price in America for wholesale pill tube key rings . American clients pay no taxes. We will send you a proof for your approval before production. Price includes your 1-color custom imprint. You may order any quantity above the minimum. Setup charge is $45.00 per color. Extra imprint colors are $0.25 per color, plus an additional $45.00 Setup Charge. Imprint Area: 3/4" x 3/8"
Packaging: polybag; 500 units per carton of 17 lbs.